While business intelligence software like Tableau helps companies better understand the data that they have saved up in systems of record like databases and CRM software, it can be hard to get the entire picture of a business from the plethora of different sources available. SkyGiraffe is launching a new connector Tuesday to help with that by allowing companies to take live data from a diverse set of systems of record and visualize it in Tableau. The connector is supposed to give businesses a single consistent means of visualizing data, without having to repeatedly configure a bunch of different integrations. A diagram showing SkyGiraffe's connector to Tableau. 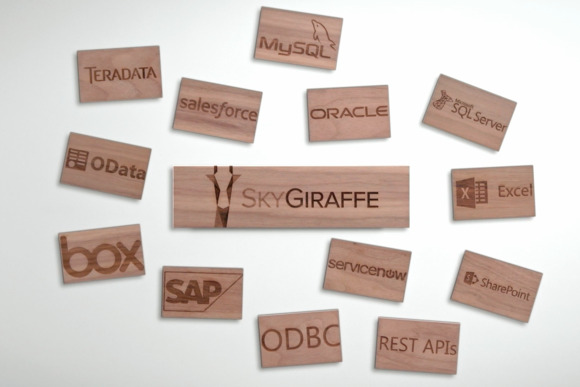 IT administrators can set up SkyGiraffe to connect with systems like SQL Server, Salesforce, ServiceNow and Oracle Database, and then surface all of those through one integration with Tableau. It's a marked difference from having to set up each system's integration with the data visualization software -- if such a thing is possible. One of the key features in SkyGiraffe's connector is the ability to limit users' data access. Because what information people see is tied to their SkyGiraffe account, it's possible to build one visualization in Tableau that shows different people different results. That should allow a manager of a single store to connect to an organization's inventory system via SkyGiraffe and just see the stock available in one particular location. That same visualization would show different stock for a different manager, without requiring reconfiguration. The move also puts SkyGiraffe In competition with Tableau, Microsoft and a host of other business intelligence companies. Each of those vendors build their own connectors that can offer similar functionality. So why not just use those existing capabilities, especially since the vendors themselves are racing to add more and more? SkyGiraffe CEO Boaz Hecht said in an interview that his company's advantage is the sheer number of different systems that integrate with its software. "Slack can develop a custom Dropbox connector, absolutely," Hecht said. "But they can't do it for Oracle on-prem, because every single instance [of that] is different. They can't do it for ServiceNow, because every instance is different." In addition, SkyGiraffe is still building out the list of applications that it integrates with. Today, users can take data that's connected to SkyGiraffe and access it on a mobile device using the company's mobile app. The company also launched a Slack connector earlier this year that makes it possible to pull that same information into the popular workplace chat app. We're likely to see more integrations like that and the Tableau connector in the future.